Knitting patterns are like books. Some, I can happily knit over and over again. And often I’m surprised by which ones make the biggest impression on me. One thing I love is how a simple pattern can be transformed by using a different yarn. This is where I bought my yarn for the Fringe Association Amanda Knit-Along. 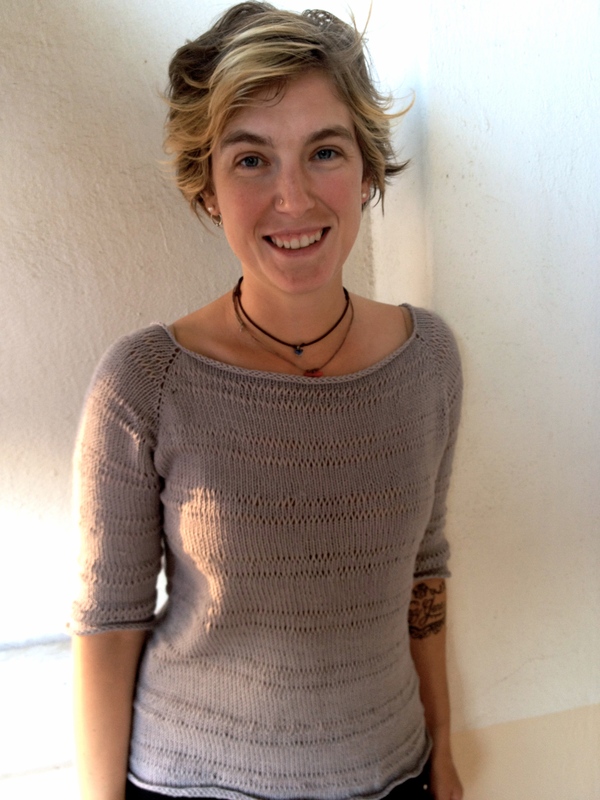 Since I started knitting for real, around ten years ago, I’ve been a sporadic and unfocused member of the “knitting community,” vacillating between working in yarn stores, making as many friends as I can, and falling off the face of the Earth. In that time, I’ve also moved to Bulgaria twice, most recently seven months ago. Bulgaria doesn’t have a knitting community any more than it has a bathroom-tiling community or a red-pepper-drying community. Knitting is simply a skill that people know (especially older female people). Nearly every woman I meet can knit, most can crochet. When I knit in public, I don’t get any amazed reactions of “OMG you’re so talented!” like in the States. Instead, I get comments of, “My mom does that,” or “My grandma does that,” or “I used to do that, before I got so busy.” Almost everyone has a few pairs of hand-knit slippers on hand for winter. I’ve shared some memorable knitting sessions with friends here in Bulgaria, most of them older women. Still, the idea of a knitting circle, or getting together in a yarn shop or cafe to knit with people, is a bit too commercial and American to have made it here yet. Knitting is still done at home, between bigger, more urgent chores. A friend of mine lived with an older woman in the mountains who wouldn’t touch knitting needles for several months of the year, too busy with chickens, vegetables, and firewood. 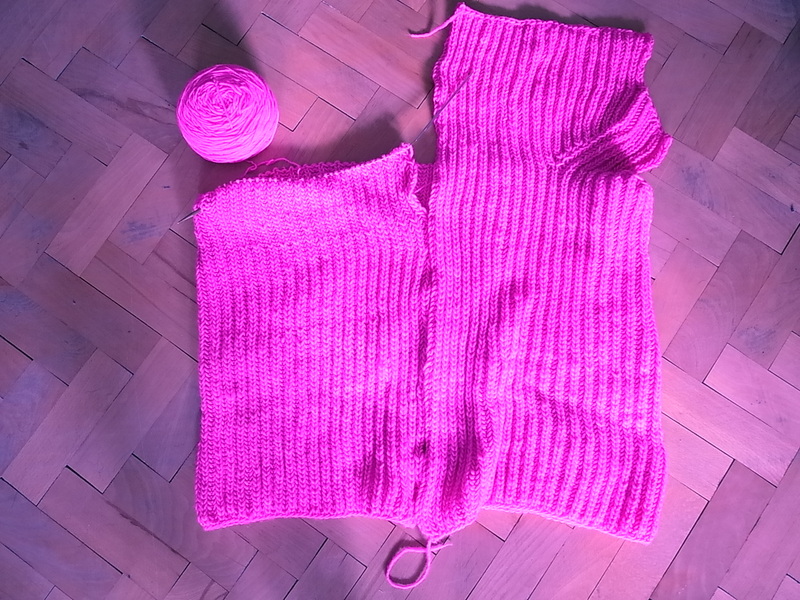 Towards the end January, at an extreme low point in the year’s chore load, she sat down with some wool and knit him an entire cabled sweater, completely improvised, in ten days. I’ve learned a lot from Bulgarian knitters, both in the concrete and abstract sense. Bulgarians have sat me down and showed me patterns, passed down to them from their mothers. And I’ve learned about what knitting means to different cultures, and what it means to me. After spending 18 months back in the USA, I’ve missed my vibrant, creative circle of friends there. I lucked out and got a job in an amazing fiber arts shop and dye studio, and had a built-in community of awesome creative minds. I loved the knitting group especially, and how one common interest brought people of different ages, vocations and backgrounds together. 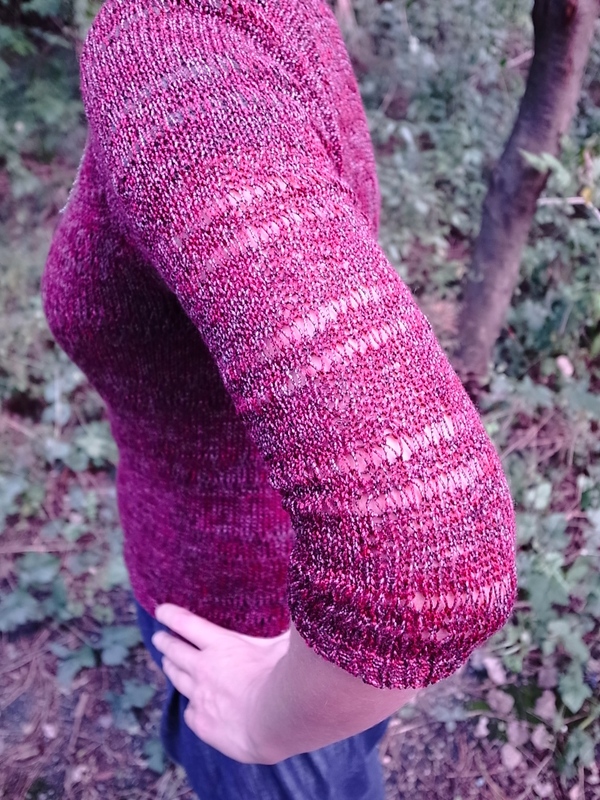 Joining some KAL’s, and starting this blog, is a way to stay connected and hopefully bridge these two different knitting cultures that I’m lucky to be part of. 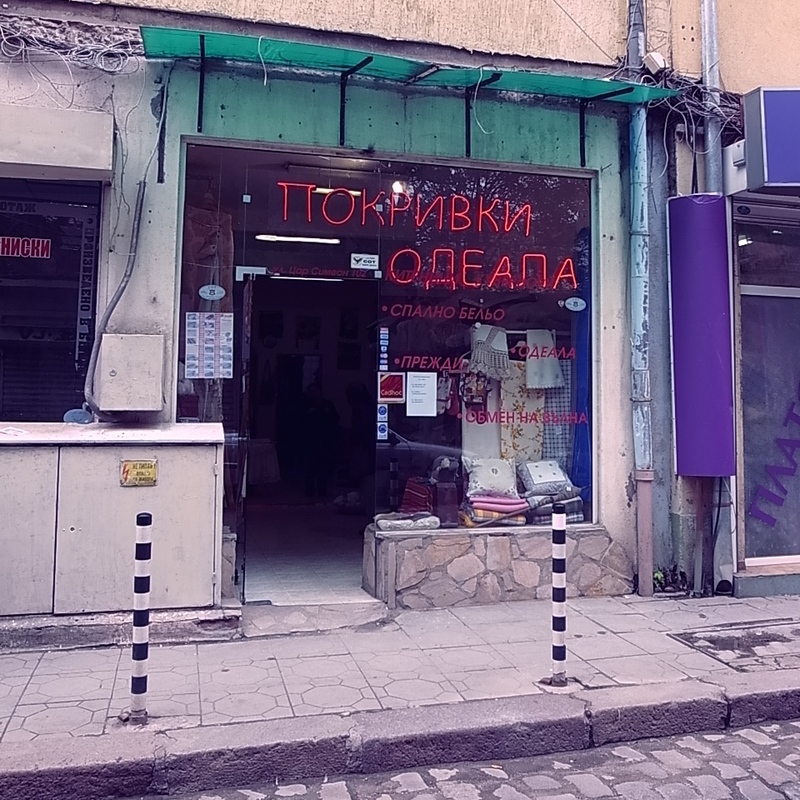 Which brought me to this little storefront, in Sofia’s wonderful but quickly disappearing women’s bazaar. On the same street as this wool shop is my boy’s barber and our favorite Turkish restaurant. Behind the heavy woven blankets and the kitschy folk placemats is a shelf stuffed with wool. I had two un-dyed colors to choose from; I chose the lighter one. 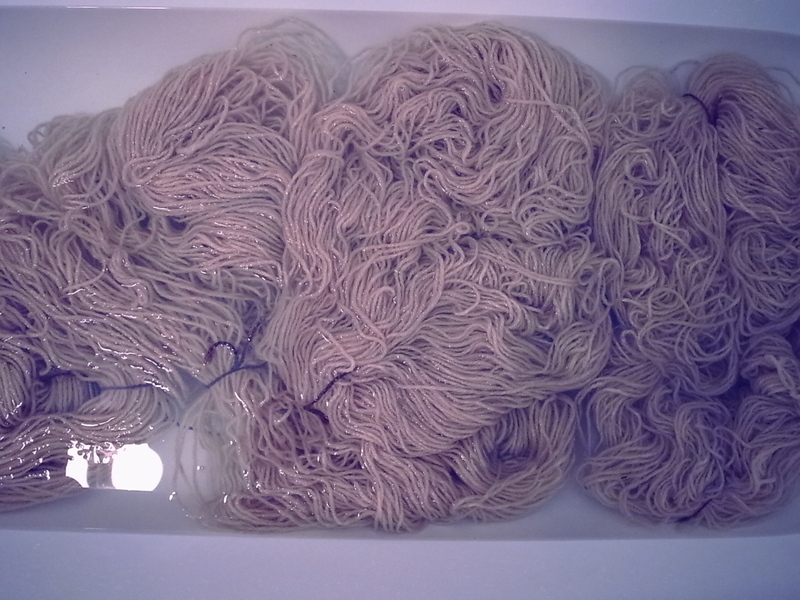 As the store clerk weighed the hanks and bagged them up for me, she advised me to wash them in a little vinegar or shampoo before knitting, to soften the yarn and take some of the grease and dirt out. I’ve gotten this advice before and always ignored it, because ain’t nobody got time for that. This project, however, I’m determined not to hurry through. I hunted for the perfect pattern, and the only ones I found that I liked were vintage patterns that had to be bought in British pounds and shipped from the UK. My paycheck is in Bulgarian leva, so paying for anything in pounds is pretty much out of the question. 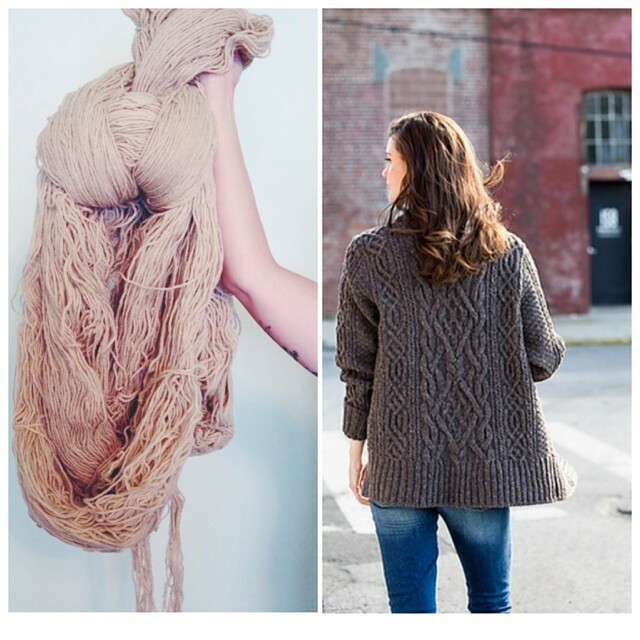 Luckily, Brooklyn Tweed came to the rescue, and published the perfect pattern. Instead of casting on immediately, I tied my skeins with little figure eights to keep them from tangling, and put them in the bathtub. I used tepid water with a little vinegar in it, and after a few hours, the water was a convincing murky brown. I left the yarn to soak overnight, spun the excess water out of it in the washing machine, and hung the big skeins on the clothesline. 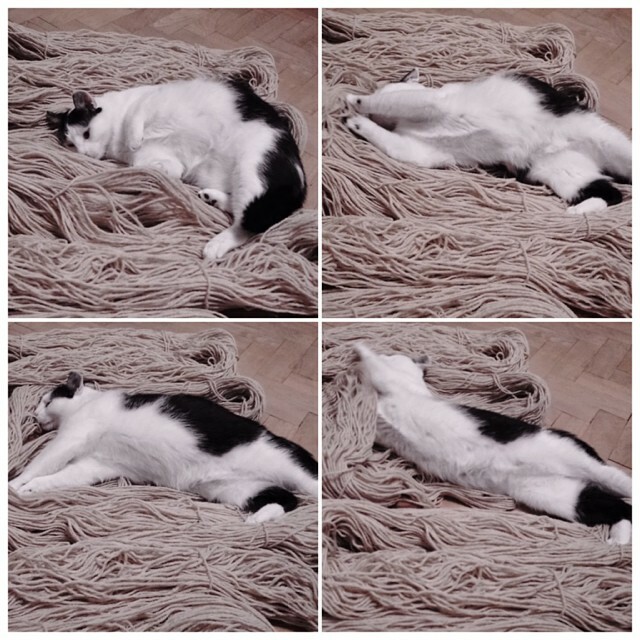 Emi, the princess in black and white, preferred the yarn before washing. September has hit me with all its usual manic nesting urges. I’ve got quite a few WIP’s on the needles (for me, at least), and maybe even some designs floating around in my head. I tend to work on one project at a time. By the time I near the end, I’m sometimes so sick of it that I’ll stay up all night knitting rather than face another day of working on it. I feel much more organized and at peace when I keep my WIP’s to a minimum. Still, I’m going to take my time with this one, get it right, and take plenty of breaks to work on other stuff. Who knows, I might even make a swatch.